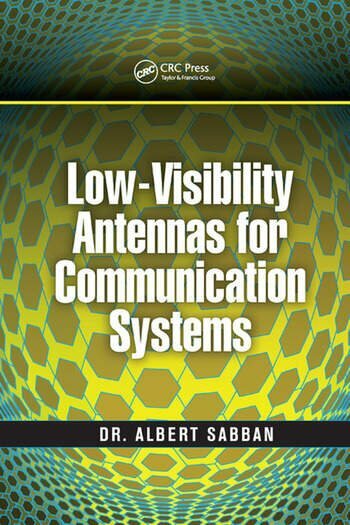 Low-Visibility Antennas for Communication Systems delivers a comprehensive and cutting-edge study of the design and application of low-visibility antennas, complete with design considerations, computed and measured results, and an extensive exploration of radio frequency and antenna measurements. Albert Sabban holds a Ph.D from the University of Colorado Boulder, USA; an M.Sc from Tel Aviv University, Israel; and a US patent on wideband microstrip antennas. Dr. Sabban is currently a senior lecturer in the Department of Electrical and Electronic Engineering at ORT Braude College, Karmiel, Israel. He was previously a senior R&D scientist and project leader at Rafael Advanced Defense Systems Ltd., Haifa, Israel; a teaching assistant in the Electrical Engineering Department at the Technion – Israel Institute of Technology; and a research assistant in the Microwave and Millimeter Wave Computer Aided Design Center at the University of Colorado Boulder. "… focused on small antennas, where interactions with small volume objects and with the human body have utmost importance. … provides detailed information on how to understand and design small antennas in such environments. Antenna designers will gain fresh ideas from insight into the author's experience."